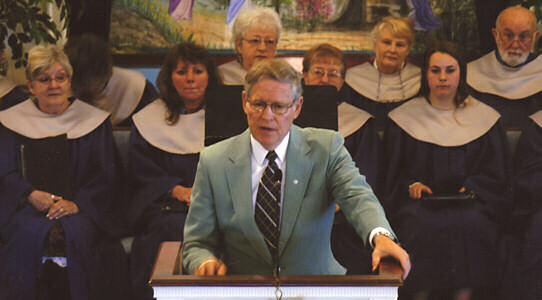 Reg Dunlap's preaching and writing ministry has spanned almost sixty years. As an itinerant evangelist and Bible teacher he has traveled almost two million miles by airplane and automobile preaching throughout the United States and different parts of the world. These dynamic expository sermons resulted in thousands of decisions for Christ and dedications to Christ as he has endeavored to reach the people of his generation for Christ. Dr. Dunlap has served the Lord as evangelist, Bible teacher, missionary conference speaker, and over twenty-five years as Senior Pastor when he has been called upon to help hurting churches. He still continues full-time in his preaching and teaching of God's precious Word. Rev. Philip Adams, pastor of the First Baptist Church, Spokane, Washington, wrote these words regarding his preaching: "Our church was thrilled with the dynamic Christ-centered Biblical messages of Reg Dunlap. The audiences night after night sat captivated by his knowledge of the Word of God and the deeper things of the Christian life. We were thrilled when on the first Sunday so many came forward as an act of dedication, reconsecration and giving themselves to the Lord. Reg left a very Christ-like impression with our people and we sincerely felt the movings of revival. We hope to have him again in our church and city." The Rev. Dr. Dunlap is an ordained Baptist minister. He has authored fifteen books and booklets and hundreds of in-depth Bible studies. Now he is making his manuscript sermons available to pastors and people throughout the world on SermonSeeker.com, and scores of his dynamic audio sermons which have been preached in crusades, Bible conferences, and churches are being made available to hear on this site. It is his earnest prayer that you will be spiritually blessed and challenged as you listen to these expository messages.